Anyone who knows me understands that, when it comes to automobile packaging, there is one solution I adore above all others, and I will never tire of contemplating that particular engineering solution. That packaging solution is this: underfloor engine, with cargo areas at both front and rear. Any car that even attempts this is immediately okay in my book, and today I’d like to introduce you to another example of this exclusive club: the Subaru Rex. The Rex is part of a glorious community that most famously includes the Volkswagen Type III, as well as notable cars like the Chevrolet Lakewood (that’s the Corvair wagon), the Fiat 126 Bis and 500 Giardiniera, the Toyota Previa, and, most recently, all currently sold Teslas. I’ll admit that I wasn’t aware that the first-generation Subaru Rex had this glorious layout until quite recently. I was aware that early Subarus were rear-engined, and at least a few early Subarus—the wagon version of the 360 and the Sambar vans—did use an underfloor engine arrangement, so it’s really not that surprising. Of course, those 360s didn’t really offer any up-front storage, as that little nose-compartment was eaten up pretty much entirely with the spare tire, so unless you were cramming in a burlap sack loosely filled with jam or marbles, you weren’t putting any luggage up there. But the Subaru Rex, as the first real comprehensive updating of Subaru’s original Kei-class rear-engine 360 platform, did manage to get some storage up front, earning it entry into my favorite class of car. 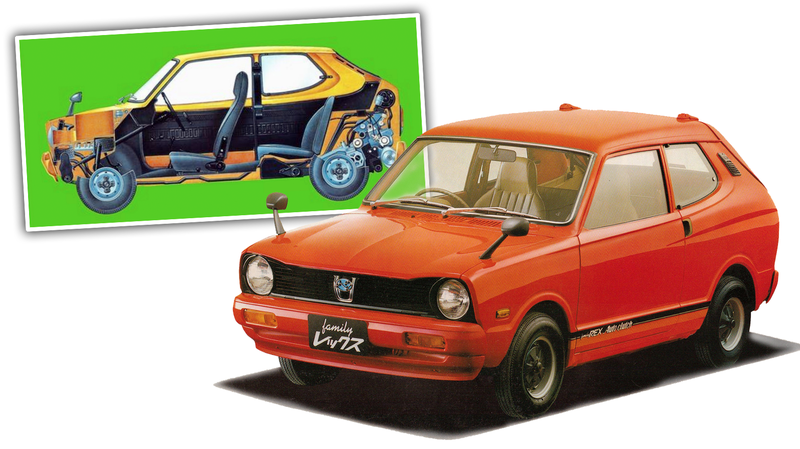 The Rex was an impressive Kei design, managing to get a lot of early ‘70s swoopy style while managing to be space efficient within the very strict confines of the Kei regulations. The Rex came in a number of body styles, including a two-door coupe, a two-door with an opening rear window/hatch to get access to the rear luggage area, a four-door sedan, and two full-hatchback versions, one with a higher roofline so it could meet the interior volume criteria for it to be sold as a commercial vehicle. I’m not exactly sure why they didn’t just standardize the more compact engine layout across the line, but I suspect cost may have had something to do with that decision. There’s just so much I find so deeply, strangely satisfying about this clever little car. Look at the engine access on this thing! Sure, maybe it’s not exactly convenient or comfortable to work on, but, conceptually, I just love the idea of it all. A swing-down door for engine access, under the rear cargo area. I don’t think it had a flip-up access panel in the luggage compartment floor like a VW Type III or Type IV wagon, but I bet that would help. The front trunk’s irregular shape (you can see it, schematically, in the diagrams on the right side, where the luggage areas are colored black) suggests a bit of a struggle to get that extra desired volume, and, as I’ve mentioned before, an obvious battle for usable space is something I have a great deal of respect for. Damn, I love these diagrams. That front trunk held 3.8 cubic feet—not a vast amount, a bit less than a VW Beetle’s front trunk, but, considering the overall size of the car, very impressive. Packaging and storage areas aside, these little cars just seemed fun. Once Kei regulations allowed for 550cc engines instead of just 360cc, you’d think the Rex would have gotten a nice bump in power, but that doesn’t seem to be the case, mostly because the bigger engine switched from two strokes to four. Sure, four strokes are quieter and cleaner, but the 360cc air-cooled inline-twin could do about 37 horsepower in its highest state of tune (you could also get it with 32 or 35 HP), while the 550cc four-stroke inline-twin was stuck around 31 HP. For a car like this, though, in the environments it was made to run in, that was likely enough power. It was still a RWD little car that weighed nothing, after all. In my head, I imagine it was somehow pretty fun, and I don’t see any harm in believing that, for a while at least. In 1981, the Rex was completely re-designed to be a modern (for that era) transverse-FWD hatchback, like so many others. While this undoubtedly was the sensible move at the time, it lacked that special magic of the underfloor rear-engined versions. So, let’s welcome the original Subaru Rex into my mental pantheon of underfloor-engined wonders!